Out of the Blue, Volume 1 is out 3/27/2019. 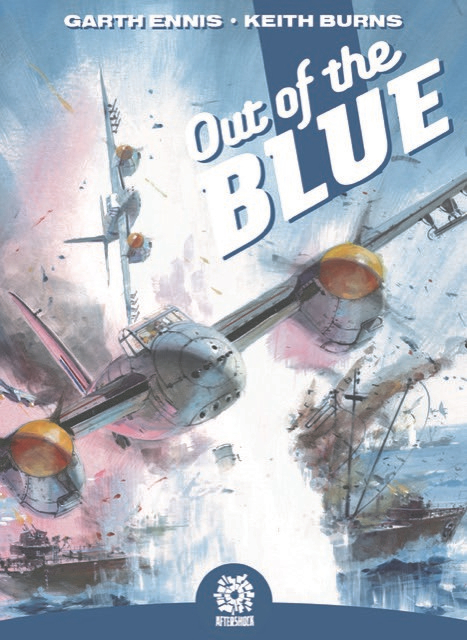 By Jarred A. Luján — Out of the Blue Volume 1, the second original graphic novel from AfterShock Comics, is the co-creation of famed war story writer Garth Ennis and the incredibly talented artist Keith Burns. It marks a reunion for the duo, which last team on another WWII aviation story called Johnny Red. Out of the Blue follows protagonist Jamie McKenzie towards the end of World War II, as he performs bombing runs on German supply lines in the worst possible plane with the worst possible commanding officer. The story has so much to unpack, but I want to jump into the artwork first. Burns is a member of the RAF Guild of Aviation Artists, a group that describes itself as the globally-recognized premier society for the promotion of aviation art. Burns is a testament to that statement. It almost feels like planes were designed for this man to draw them. The opening page of the book—a De Havilland Mosquito Fighter-Bomber flying over the remnants of a burning German ship—is in and of itself an amazing piece, and it sets the tone for the book. The battle sequences in this story are also more than just big and explosive; they’re dramatic and intense. Burns styles these pages in a way that showcases what a feat of machinery these little planes are, also capturing the depth and destruction of warfare. It’s all thrilling to look at, and this art alone could sell me on the book. This story has one of my favorite casts of characters from any Ennis book in a while. Joseph Ranjaram, an Indian soldier in the British military, is the calm and eloquent balance to another character, Jamie. Jamie, in his own right, is a fun character, but it becomes clear early in the story that Jamie…well, Jamie is sort of an unlucky guy. His constant stumbles bridge upon heartbreaking turn after turn, which, ironically enough, is what introduces him to Joseph in the first place. Jamie getting partnered with Joseph is meant to be a punishment due to his race, and I loved that touch. Any WWII book that doesn’t shy away from the ugly shadow of racism, particularly and openly cast by Broome here, is one that adds an immersive edge of realism to its work. It should come as no surprise that Ennis, a man who happily introduces the harsh realities of war on the regular, is willing to address that unflinchingly as well. Now, bear with me as I give a brief history lesson, one that I promise is relevant to this book. For those who maybe missed a history class or two, England suffered a pretty brutal time in WWII. From the May 1940 evacuation of Dunkirk to the intense bombing that occurred from July to October 1940, times were rather dark for the country during the war. Now, one of the things that I love about this time period in particular is the war propaganda that came out of it. I know, that seems like a particularly dorky thing to find interesting, but the differences in experiences of the war come out so clearly in the way nations represented it to their own countries. For example, American propaganda is vengeful, it’s angry. Reasonably so, something like Pearl Harbor is certain to bring out those feelings in a nation. England’s went another way, though. While there were certainly feelings of anger and frustration and vengeance, much of England’s propaganda was hopeful, because for quite some time it seemed like the end was nigh for Britain. There’s been plenty of time spent dissecting Churchill’s “We Shall Fight on the Beaches” speech, given at the beginning of the intensive bombing, but it captures so well the British approach to their situation: Don’t lose hope, fight on. That spirit is so wonderfully captured in this story. It’s a story of Jamie, who can’t seem to do a damn thing right at times, and who is given every reason to give up but refuses to do so. He just seems to find himself in the plane, in the midst of battle, fighting for something worth fighting for. The book feels lighter than some of Ennis’ prior work, and I say that as someone who loved Punisher: Born and Sara (which I also reviewed), but that lightness is perfect for this story. It has dark edges, to be sure, including racism and Broome’s nastier intentions later in the book, but you can see the central vein of hope throughout Jamie’s story. The last few pages of this book are so great and so beautiful, and they capture the theme so well that I spent a very long time soaking them in. If there is one thing I find frustrating about the book, it’s that the release is split in half. Volume 1 isn’t a cohesive story, it’s part of a much larger story that will obviously conclude in Volume 2. Yet, it feels like we’re really just kicking off by the time we get to the end. It feels a little disappointing that we can’t dive into it next month, like a monthly serial, or continue going through it, like a regular graphic novel. That’s a minor thing, and maybe that being my biggest issue is only another indicator of how much I enjoyed reading this. Ennis and Burns make fantastic comics together. Read more graphic novel reviews with Trade Rating.